Tuesday July 20th 1909 I ironed this morning did other work I had the head-ache all day I laid down awhile in afternoon. Will finished the [oats?] at noon The men did not get quite done the shed kitchen I did some work in the cellar in the afternoon. a letter from Lydia Wednesday July 21st 1909 The men finished the work in a little while and we cleaned up the [scraps?]. I went to town in the afternoon to do a lot of errands was at Dr Smiths office as my eyes have been hurting me. I got home at 4.39 and looked over some bills and talked with Will awhile. I did the evening work and went to bed early. 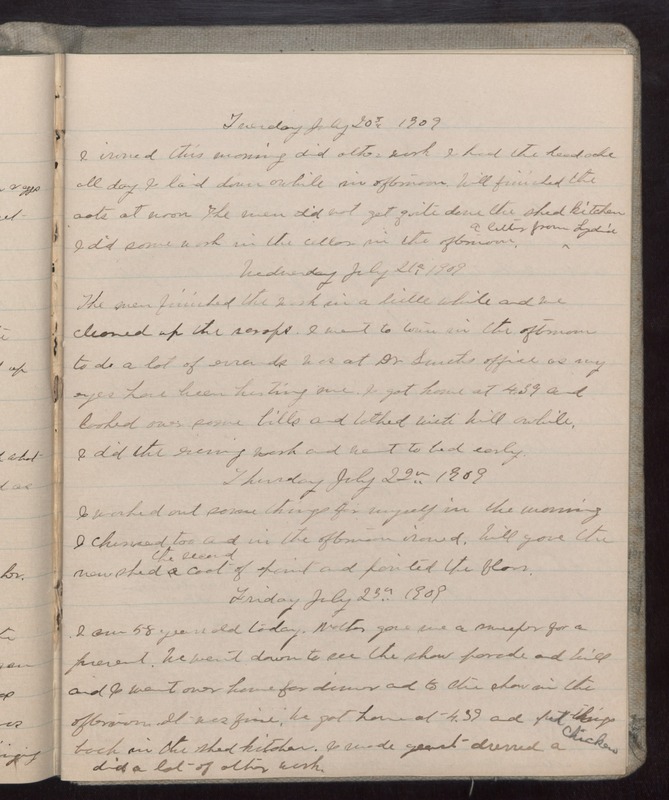 Thursday July 22nd 1909 I washed out some things for myself in the morning I churned too and in the afternoon ironed. Will gave the new shed the second coat of paint and painted the the floor. Friday July 23rd 1909 I am 58 years old today. Mother gave me a [sweeper?] for a present. We went down to see the show parade and Will and I went over home for dinner and to the show in the afternoon. It was fine, we got home at 4.39 and put things back in the shed kitchen. I made yeast dressed a chicken did a lot of other work.